The benefits that the presence of water brings to a landscape are rewarding, in that it provides visual and auditory pleasure while adding a psychological element that is capable of easing the soul. Landscape Design & Landscape Construction, Inc. utilizes its' expertise to carefully design water features that meet the criteria of both the client and the site. The highest quality of materials and workmanship are used in the construction of all aspects of our water features. Whether it is a waterfall, pond, stream, or specialty feature, this form of landscape element can create an experience that captures the senses. The soothing sounds of a waterfall not only create a relaxing ambiance, but it also has the added benefit of helping cancel out undesirable noises that originate outside the garden. Regardless of the size or scale, the impact of waterfalls adds visual interest to a landscape. This natural element offers an undeniably beneficial presence in the garden. The still and pristine water of a pond inspires quiet reflection as it graces the garden landscape. Blending ponds with other water features, plant materials, and the surrounding landscape creates the atmosphere of a private garden oasis. By incorporating the appropriate filter system to ensure water quality and clarity, a pond may also be designed to support fish. The ripples of water gently flowing down a streambed invites the soft sounds of water into the landscape. 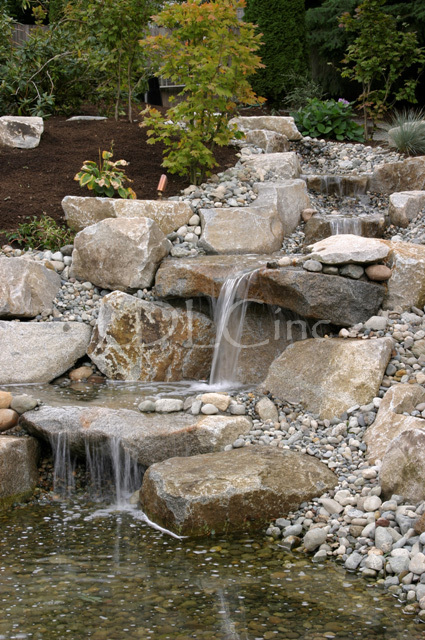 When incorporated with shallow falls while meandering through the landscape, a tranquil stream encourages movement and mystery that helps unify spaces within the garden. Specialty water features are designed to meet a client's specific design and architectural needs. Whether the product is an artesian feature or bubbling water pot, special consideration is given to unique circumstances to create a distinctive yet effective water feature.